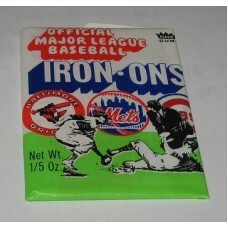 Sealed, Unopened Wax Pack of 1968 Fleer Baseball Iron Ons. The pack doesn't say how many Iron Ons per pack, but from doing some research online, we're pretty sure it's 3 iron ons per pack. Produced by Fleer in 1968. Unopened Wax Packs from the 1960's are extremely rare and a nice addition to any collection. We have a limited quantity of these, and once they're gone, they're most likely gone forever! Do you have any questions about Unopened Wax Pack of 1968 Fleer Major League Baseball Iron Ons?